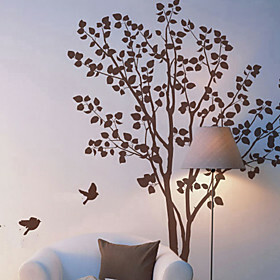 Tree wall stickers are great for a bedroom, or other places where you want to relax. 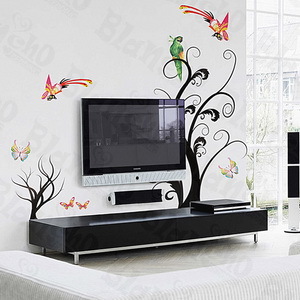 Trees are somehow associated with sleep, and they add a natural feeling to your room (no matter where you live). 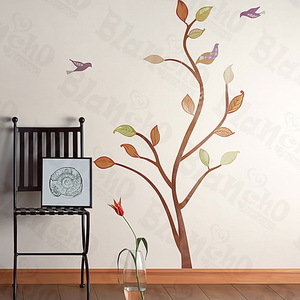 I've also put up wall stickers with branches on them: if you put a branch in the right place, you imagine the rest of the tree with it. 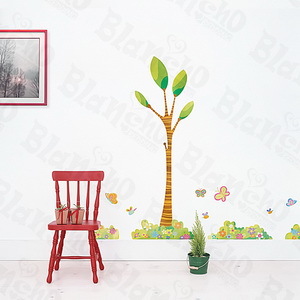 Down the bottom of this page you'll find some kid's room wall stickers with trees on them. Assembling a tree like this needs a few extra hands. 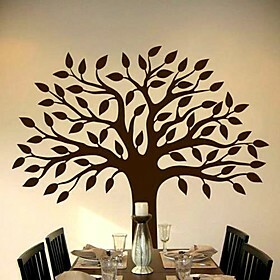 Check here for a youtube video on how to assemble a tree wall sticker. This tree almost touches the ceiling. The rest of the tree is more or less suggested. 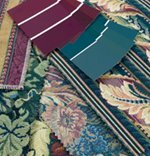 This design comes in green as well. 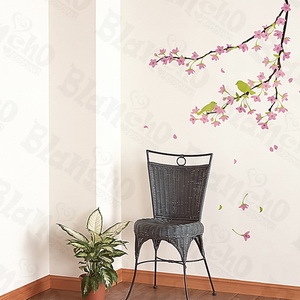 There's a subtle feeling of bliss connected to flowering branches. In Japan, it's a national event when the cherryblossom appears, and everyone eats outside under the trees. 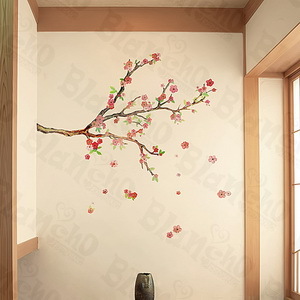 One Japanese poem: "Did I see the blossom hover free from the branch? Oh, it was merely a butterfly". (for butterflies, click here). 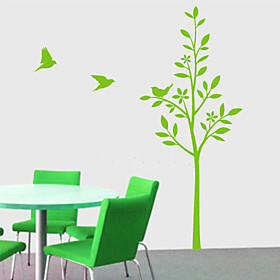 These tree wall stickers are in one color, but they're available in many different colors (a few dozen). 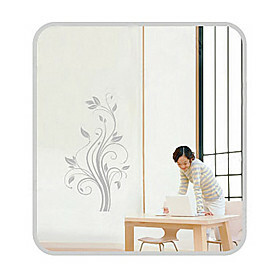 The one from LightinTheBox is available in less colors, and no size is indicated - but the price difference is noticeable. A branch can be placed very well on a wall that's cornering with a window, then it'll be just as if the shadow is cast from a tree outside. 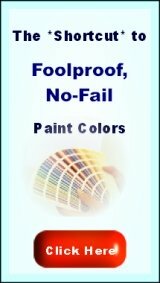 When you choose a color just somewhat darker than your walls, it will be as if you see the shadows of a real tree on your wall. Notice: it'll be more realistic to have two individual branches, than four equal ones. 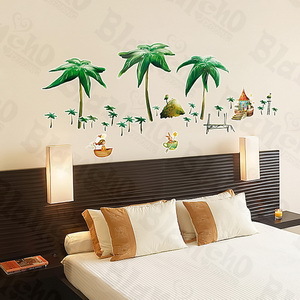 with a tropical feel to it. 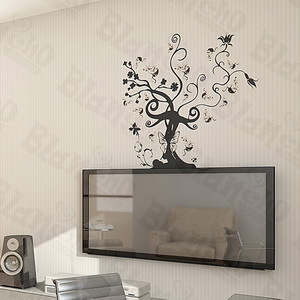 a truly fabulous abstract tree. 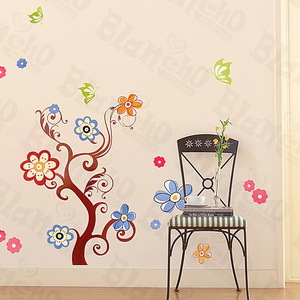 These tree wall stickers are a of a different style - a little wilder, but dreamy at the same time. 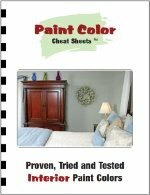 Great for older kids, or your own bed- or living room.